Now that we have completed an overview of Chalmers’ Lectures on the Establishment and Extension of National Churches (1838), I’d like to make a number of observations and raise some questions. I’ll start with general ones and then cover some specifics by subject. So first, some observations and questions on the whole. One cannot read through Chalmers long without figuring out that he was a practical thinker. He had goals to which varies strategies and experiments were subservient. Strategies, further, are only as good as they work efficiently. Chalmers argued for religious establishments because they were, in his judgment, very useful and proven expedients. And the goal? In a word, ‘Christianization.’ Or, more specifically, ‘the Christian good of Scotland.’ His vision was the infiltration of the Gospel throughout his home country and its anticipated leavening effects socially. He dreamed of realizing within the darkness of industrialized Britain the old Christian communal ideal of his childhood memories. So really, we should say that Chalmers was a practitioner second and a visionary first. It is also clear that Chalmers was a large-hearted philanthropist. He was concerned with the well being of the poorest of Scotland. They needed an endowed establishment because they did not have the financial wherewithal to support the ministry. And, more often than not, they lacked not only money to support the ministry, but even the religious impulse to go and seek after the good of their souls. Should they be left to themselves, sitting in the sink of their moral, economic, and especially spiritual squalor? This dovetails into Chalmers’ view of government, which manifests itself in these lectures as thoroughly paternalistic. Frequently, he appeals for national establishments on the principle that parents should “lay up for the children” (2 Cor. 12:14). “What is true of the smaller family of a household, holds true of the greater family in an empire. If both the parent in the one case, and the governor in the other, be chargeable with a guilty indifference who should suffer their respective families to remain unschooled – there is guilt of a deeper die, if, by the indifference or neglect of either, they are suffered to remain unchristianized” (92). If a Christian father is duty-bound to provide Christian instruction to his children at home, ought not the ‘city fathers,’ as it were, patron-ize a religious establishment to school their citizens in the teachings of Jesus? The last general observation is that it seems the tone of his lectures fail to reflect a strong evangelical concern for personal salvation. He does speak about the civilizing influence of Christianity (167) and urges the endowment of a national Church as reflecting a “true and enlightened patriotism” (170). This, of course, does not show that Chalmers lacked a passionate zeal for the personal salvation of those who would benefit from a robust establishment. He most certainly did. But if I am at all putting my finger on something here, my guess is that this subdued evangelicalism reveals a broader audience, even those influenced by the Moderatism of his time (from which his evangelical conversion had freed him!). The Moderates were all for education, all for civilization, and even for Christianity insofar as it furthered man’s intellectual, moral, and social condition. If they could stand with him in this cause, then so be it. In short, I think it is important for us to read these lectures, not as seminary addresses on Missiology for churchmen, much less as a series of sermons to rally the troops back at church. But we should read them with the sensitivity that they were delivered and published for many, not the least of whom were MPs sitting on the fence of a pressing, political question. Now, some specific observations and questions; and first, on the particular establishment theory of Chalmers. His arguments strike me as distinctively post-Enlightenment. For him, a national establishment means the endowment of a national Church in an environment of political tolerance. His Scotland was a “land of perfect toleration” (182). And so his establishment is one that encourages and promotes, but doesn’t discourage, much less impose sanctions on the Kirk’s enemies. There is no sword here to back up the Church, and it is here where I sense a break with the original establishmentarianism of the 16th century magisterial Reformers and their 17th century heirs. One searches in vain to find language in the Lectures that comes anywhere near the words of the Westminster Confession of Faith on this point, that it is the duty of magistrates to ensure that “all blasphemies and heresies be suppressed, all corruptions and abuses in worship and discipline prevented or reformed, and all the ordinances of God duly settled, administrated, and observed” (WCF 23.3). However, while I do perceive a break here, there does seem to be strong continuity between the magisterial Reformers and Chalmers in a shared paternalistic view of government. Chalmers followed in well-worn paths when arguing that magistrates should be “nursing fathers and mothers” to the Church (Isa. 49:23). There is also continuity in his argument against indifferentism on religion in the affairs of the state; and so he here appears to be in open conflict with the Enlightenment trajectory. “It is reckoned to be in the magistrate the very perfection of enlightened patriotism on this subject, when like Gallio he cares for none of these things” (92). Such make a distinction between “Christian governors and a Christian government” (94). But Chalmers will have none of it, much as his spiritual forbearers. By way of humble criticism, it appears as though Chalmers’ arguments against the Voluntaries are too simplistic. He puts the onus back on them to demonstrate why they should hold aloof from the established Kirk, when the differences that separate them from her are so minor. But what of confessional subscription? And even if the Voluntaries had wanted to return, would the Kirk have been as willing as Chalmers to re-welcome them into the fold? I am also unsettled as to Chalmers’ arguments for the basis on which the government should select one Protestant denomination over another. He argues that it is a purely practical one. Which denomination is best for the goal in view, that is, the Christian education of the people? Here again, the highly practical character of Chalmers comes through. But what is meant by ‘best?’ Does this mean the most efficient organ for teaching the people? If so, then this is a question of teaching performance, not of teaching content. If this is the basis, couldn’t the government occasionally test the performance of the established Church, and finding it unsatisfactory, experiment with the performance of, say, the Methodists? He does argue that doctrine counts in the selection process when the choice is between Roman Catholicism and Protestantism, but does it count for nothing after that choice is resolved? What place, then, do the Westminster Standards hold in this matter? The second specific observation is on his treatment of free trade and Christianity. I find this section absolutely fascinating and do not know of anyone before or since who has dealt with it as capably as he. It is spot-on! Chalmers seems to have put his finger on the beginnings of a market-oriented paradigm in the evangelical world long before it flowered [or degenerated] into the seeker-sensitive paradigm of today. And I think he has defined the issues in clearer philosophical terms than I have come across even in modern critics of that movement. One could say that Willow Creek is a natural consequence of importing the principles of liberal economics – the free, uninhibited exchange of goods and services by the operation of the law of supply and demand – into the work and witness of the Church. A related observation needs to be made here. Chalmers presumes a Calvinistic anthropology in his arguments against free trade in Christianity. Man is totally depraved. “Nature does not go forth in search of Christianity; but Christianity must go forth in search of nature” (53). 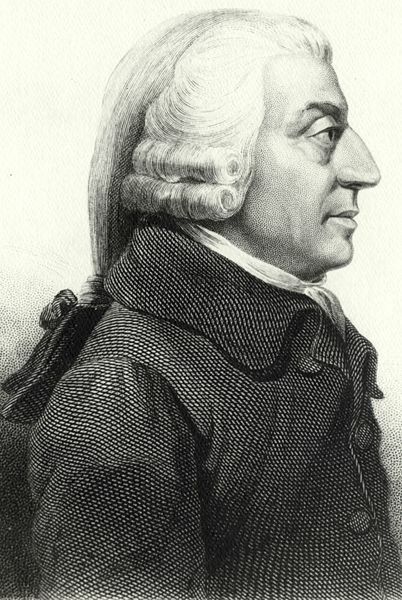 That is why it is profoundly flawed to subject Christianity to Adam Smith’s economic principles. But this rejection of laizzeis faire religion, so to say, only makes sense within the Calvinistic orbit in which Chalmers then moved. Could he have envisioned the ascendancy of evangelical Arminianism in Great Britain and America, with its somewhat more optimistic anthropology, he might have been able to predict Willow Creek. That is, he might have forecasted the adaptation of Christianity to the unsaved man. Make the supply of Christianity more attractive, and the demand in the spiritually ‘sick’ will be teased out. There were really two enemies at work, then. Free trade, the commodity, and evangelical Arminianism, the willing buyer. I’ve written elsewhere on Chalmers’ advocacy of the locality principle, or territorialism. But before simply passing on, a couple of comments are in order. The first is that Chalmers has explained for me something that I think I hadn’t understood – or fully understood. The language of a ministerial ‘charge’ has been a longstanding part of Reformed ecclesiastical jargon. A minister is installed into a pastoral ‘charge.’ He therefore has a responsibility placed upon him by God and superintended by his colleagues. Is he faithful or unfaithful in his charge? I think, however, that contemporary Reformed Christianity has lost a significant element of what Chalmers, following in the steps of the Reformation forefathers, understood in a ‘charge.’ A charge for them was more than a defined congregational responsibility. It was that, but it also included the assigning of a district to a minister for evangelistic efforts. The congregation and the parish, related but distinct, were his twofold charge. Ideally, the meetinghouse would be located within the assigned geographical district to evangelize that the minister could more easily and efficiently perform both duties in his charge. Incidentally, I suspect that the same flattening of meaning occurs today with the language of presbyterial ‘bounds.’ But that rabbit trail will have to wait for another day! I would also like to raise a question about a somewhat peripheral matter on territorial visitation. Chalmers responds to those who suggest that district visitation is idealistic by saying that warmth and appreciation should be the natural response among those visited (156). And that was, he says, his and others’ experience. However, one might ask whether the people whom Chalmers and others visited responded with such warmth in large part because they enjoyed fond memories of ministerial visitation in their past. Those who lived in these large, industrialized urban centers in the 19th century were largely former country-dwellers of rural Scotland. And so they (and if not they, then their parents) probably would have had exposure to a regular parochial ministry that would have included house-to-house visitation. If that is the case, then one should not necessarily expect such a warmth for clerical visitation in a place where this had never really been the practice, such as the United States. This is not an argument against the territorial principle, of course. I am fully behind a modern-day application of it. But I think that people will be tend to react with more coldness to such visitations in part because it was never a cherished memory. And then, of course, there is the pesky problem of the Russellites. The other ‘secondary’ strategy that Chalmers touches on is education. This has had a long history as a tool in the Kirk’s handbag for the Christianization of Scotland, going back to the magisterial Reformation under John Knox. It is not surprising then for Chalmers to place a bulk of his hopes for the success of the territorial plan on the work of the parish schools. Our best hopes, we confess, are associated with the coming up of another generation; and under a right treatment of the ductile and susceptible young, congregated in parish-schools, and trained from earliest boyhood to a punctual attendance on the ministrations of the parish clergyman. He [a territorial minister], if put in possession of a complete parochial economy, is on mighty vantage ground . . . Over and above the juvenile influence, which, through the medium of their youth, he transplants into the bosom of families, these schools become the direct nurseries of the church, – the feeders, as it were, of that grand reservoir, which, in return becomes the center and the fountain-head of a rich moral dispensation, to the neighborhood around it; and so more prolific blessings every year, as it rises onwards from its first slender beginnings – till filled to an overflow, even before the expiry of the present, or commencement of the succeeding age (168). For Chalmers, both territorialism and education are expedients in the program of the Church’s extension, and expedients in the life and witness of the Church are not ipso facto wrong. But I question whether education ought to come under the direct auspices of the Church, like an agency within an organization. There are two reasons I raise this doubt. The first is biblical, the second more theological. In terms of the biblical objection (and I raise it very hesitantly, before such a revered figure as Thomas Chalmers), education – vocational or literary education, that is – is more of a distinct institution. And as an institution, it does not appear to have been placed by Christ under the direct government of the Church. The ascended Christ has lavished officers upon His Church and has committed to them the keys of the kingdom of heaven. They preach, teach, administer the sacraments and exercise discipline. But vocational/literary education of the young doesn’t factor here. This would seem to come under the auspices of parents, who are to provide for their children (2 Cor. 12:14 – and maybe this argument can be used to justify the state’s purview in education, if the government is an assembly of civic fathers). Territorialism, on the other hand, does not appear to me as a distinct institution, but is nothing other than a wise deployment of the Church’s officers and ordinances in the interests of its unity and propagation. It doesn’t ask for a place among the institutions or ordinances of the Church, but simply says, please use them wisely and efficiently! Don’t get me wrong. I am a firm believer in Christian education. And the Church certainly has an interest in the education of the young. But its influence must be indirect. I could misunderstand Chalmers and his Scottish predecessors on this point. Perhaps they did see education, not as an affair of the Kirk, but of parents, whether immediate, civic, or both. If the Church, in the interests of future generations both in the Church and in the community that it seeks to Christianize, exercises an indirect influence, then I am content. Or, if by ‘Church,’ we distinguish its ‘lay’ element from the ‘clergy,’ I suppose we could say that the Church can directly play a role in the education of its young and the young of the community as a tool in the greater cause of Christianization. But I don’t think that’s how Chalmers conceived it. I could be wrong, however. My second hesitant objection is more theological. When I was first introduced to Reformed thinking, I was introduced to Covenant Theology. God has throughout human history dealt with man on a federal, representative basis. This also applies to the Gospel, which is the Covenant of Grace. ‘To you and your seed!’ That is the Gospel, both in its essence and in its administration. And so we baptize our entire household as an outworking of that Covenant. If the Gospel is covenantal, essentially and administratively, then evangel-ism must also be covenantal. “For the promise is unto you, and to your children, and to all that are afar off, even as many as the Lord our God shall call” (Acts 2:39). The aim of preaching is then in the first place to win the parents, and only secondarily, through the parents, to win the children. Peter came to Cornelius and Cornelius summoned his house. But education as a distinct and direct tool in the hands of the Church aims to win the young, and through the young, to win the parents. Chalmers doesn’t shy away from owning this, and I’m not sure I’m comfortable following him. It seems un-covenantal in its administration.